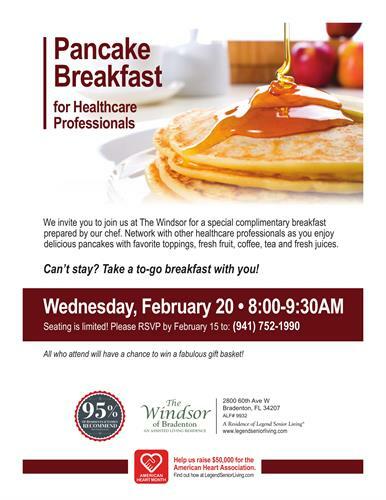 The Windsor of Bradenton invites local area healthcare professionals to join us for a special complimentary breakfast prepared by our chef. Bring your business cards as this will be an opportunity to network with others in the healthcare industry. Enjoy delicious pancakes with syrup and your favorite toppings, fresh fruit, coffee, tea, and fresh juices. Can't Stay? Take a breakfast to-go box with you to the office!